Taliban gunmen in Pakistan yesterday shot dead five women working on a polio vaccination campaign. 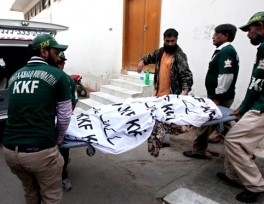 The victims, all Pakistani volunteers, three of them teenagers, died in coordinated attacks in Karachi and in a village in Khyber Pakhtunkhwa province in the north-west. Taliban militants have not admitted carrying out the murders but they are fiercely opposed to the United Nations-backed polio initiative and medical teams have received threatening phone calls warning that they would regret helping the "infidel" campaign. 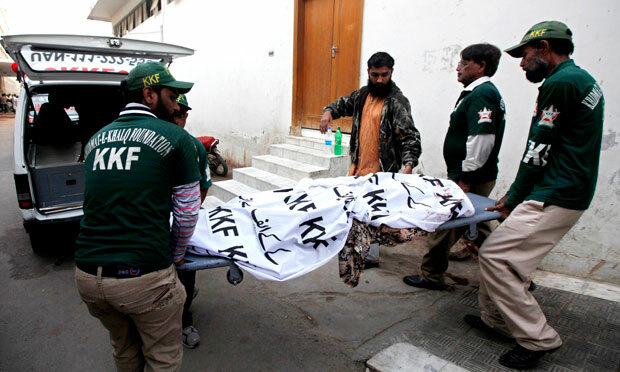 Four of the women were killed in Karachi and two male workers were critically wounded in the shootings. Gunmen on a motorcycle shot the fifth victim in a village near Peshawar. The attacks in Karachi were well coordinated and took place simultaneously in three different areas of the city, a police spokesman said. A male volunteer with the World Health Organisation's anti-polio campaign was killed in Karachi in Monday, when the government began a three-day polio vaccination campaign in the highest risk parts of the country. The campaign in Karachi was suspended after yesterday's shootings. Janbaz Afridi, a senior health official in Khyber Pakhtunkhwa, said the attacks would not stop the government from continuing its vaccination programme in the province and tribal region, the country's main sanctuary for Taliban militants. "These incidents are depressing and may cause difficulties in the anti-polio drive, but people should not lose heart," said Mr Afridi. "The government is very serious, and we are determined to eliminate polio despite all odds and difficult conditions." The Taliban have spoken out against polio vaccination in recent months, claiming the health workers are acting as spies for the United States and the vaccine itself causes harm. Militants in parts of Pakistan's tribal region have also said the vaccination campaign could not go forward until the US stops drone attacks in the country. The shootings in Karachi yesterday all took place in areas mainly populated by ethnic Pashtuns, said Sagheer Ahmed, the health minister for surrounding Sindh province. The Taliban are a Pashtun-dominated movement, and many militants are reported to be hiding in these communities in Karachi. The immunisation campaign was suspended in Karachi in July as well after a Pakistani volunteer was shot to death and two UN staff were wounded. Pakistan is one of only three countries where polio is endemic. The virus usually infects children living in unsanitary conditions, attacks the nerves and can kill or paralyse. The government has also teamed up with UN agencies in a nationwide campaign to give oral polio drops to 34 million children under the age of 5.